It’s a feeling that can’t be denied. Sometimes you just have to submit to his reign. The King, who was born on Jan. 8, 1935, and died on Aug. 16, 1977, can dominate your consciousness, infusing his spirit and vitality into your heart and soul, adding an extra sparkle to your days. He shines that spotlight in your eyes, slaps you right across the face, reminds you to wake the hell up, look around, forget the pettiness of everyday life, and savor the world around you. You have no choice but to sit back with him, laugh at the stardom, laugh at any notion of legacy and fame, and listen to some great music from a true American original. Don’t the fight the urge to do some affectionate impersonations, or just watch Johnny Cash, Jim Carrey, Eddie Murphy, and Val Kilmer do their own. 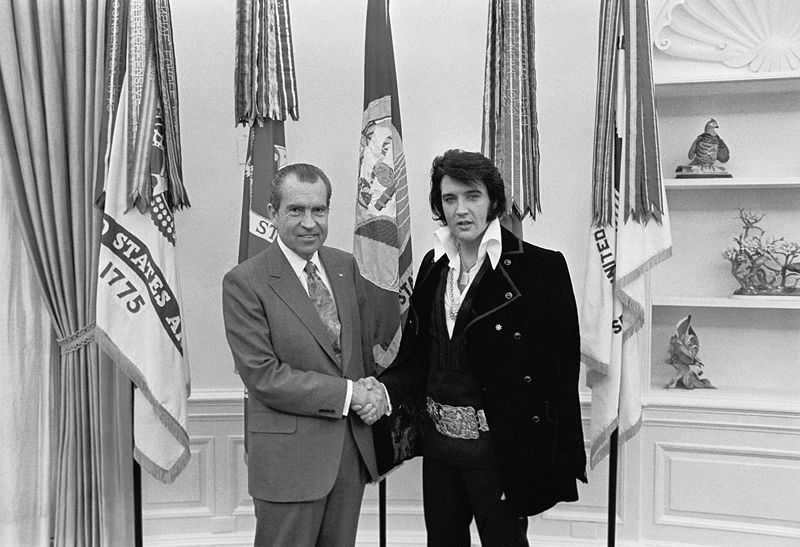 Several years ago, the National Portrait Gallery recorded a short but very informative introduction to the fascinating and bizarre meeting between Elvis and Richard Nixon (above). Also, Legacy Recordings released a magnificent series of podcasts exploring the rise of Elvis, his gospel roots, his comeback performance in 1968, his 75th birthday, and his Vegas years. Links are included below, along with a few Elvis performances. Enjoy.